W hen a spine is deemed unstable, spinal fusion and instrumentation have been found to help both bring stability to the spine and ease pain associated with the instability. 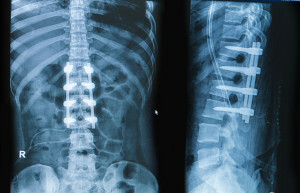 Both spinal fusion and instrumentation are used to treat spinal deformities like scoliosis and kyphosis. While both of these treatment options remove mobility of certain vertebrae, most patients report an increase in overall mobility thanks to the loss of pain associated with movement. The Spine Center at Orthopaedic Associates of St. Augustine is proud to have Orthopaedic Associates of St. Augustine is proud to have Dr. Brian Haycook on staff to offer patients the best possible care. Spinal fusion involves permanently and organically connecting two vertebrae, the bones that make up the spine. A bone graft is used, either from the patient or from a donor, in conjunction with the naturally occurring bone to fuse two or more vertebrae together. 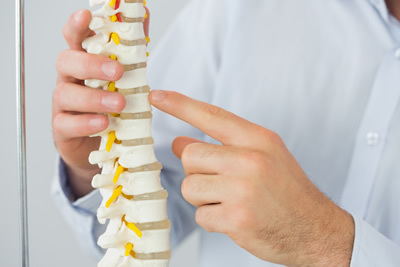 This generally reduces the pain caused by abnormal motions of the vertebrae being fused. While spinal fusion uses only bone growth to connect vertebrae and stop unwanted motion, spinal instrumentation utilizes medical-grade metal rods, hooks, screws, plates, and braided cable. A combination of these tools is used depending on the patient’s specific spinal needs. Like fusion, this procedure helps stabilize the spine by removing the mobility of the unstable vertebrae. Each case of back pain has to be investigated in an individual manner as there are several factors that could play a role in the pain. If you’re experiencing ongoing back pain, we strongly urge you to speak with an orthopaedic spine doctor. Meeting with a specialist can help you determine the exact cause of your pain, meaning your treatment will be accurate for your particular case. If you’d like to meet with our spine specialist, please request an appointment online or give us a call at 904-825-0540.